A mob of servitors hurried aside and a dozen chapter serfs bowed their heads as the enormous Astartes warrior made his way through the ship's relic chamber. The air inside the lair was moist and hot of the steam and ventilation mist that ascended from beneath the floor grill. The Space Marine slowly climbed the short ramp upon an altar and briefly knelt before the massive, armored war engine. 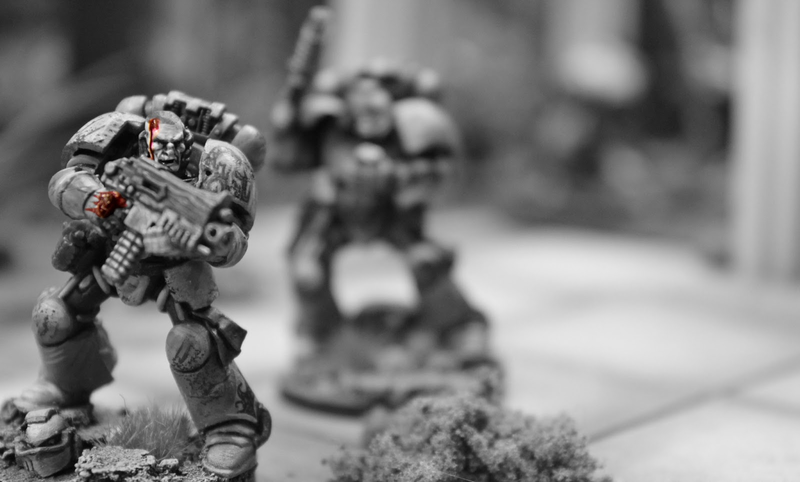 As his Techmarines whispered their final rites and made their leave, Captain Priorace removed his helmet, revealing a scarred, bleak visage with a pair of pitch-black eyes. "Ancient Coeus" Carcharodon commander addressed the Dreadnought. "I bid you welcome to our Emperor's battlefield." The war machine remained silent, a distant, blinking light reflecting from its visor plate. "Our planetside expeditionary force has been ambushed and pinned down by the foul traitors of the Word Bearers legion. The PDF Centurion has requested reinforcements and Task Force Megalodon is being mobilized under my command." The Captain turned around and took a step down the ramp, his helmet's radio network was already buzzing with operational intelligence and calculated combat data. "Our Scouts report that Ancient Lewini has fallen." The shriek of an engine grinding to life screamed through the chambers and the moan of whirling chainblades attracted the attention of nearby servitors. A group of hooded Tech Adepts rushed past Captain Priorace and threw themselves to the floor before the awakened Dreadnought, bowing their heads in worship. "My captain..." the war engine gnarled. "Direct me to the battle." "Aye, brother Coeus. Your drop unit is being primed as we speak." A deep growl echoed through the sarcophagus hailer. The Captain turned to face the Dreadnought again. "First wave." the old one demanded. "For my brother." "First in, last out, Ancient."